European aerospace giant EADS has said it will make a solo bid for the $35bn (£20bn) contract to build a new fleet of US military air refuelling tankers. EADS and US partner Northrop Grumman abandoned their planned bid for the deal last month saying the process was biased against them. They had argued that the terms of the tender favoured US group Boeing. EADS re-entered the race after the US government extended the bid deadline. It has until 10 May to make a bid. The EU has pledged to watch the tendering process very carefully, with Brussels having earlier said it would be "extremely concerned" if EADS was prevented from fairly bidding for a major US defence deal. The US Air Force is seeking to replace its ageing fleet of 1950s-built KC-135 air tankers, which refuel other military planes in mid-air. The process has had a protracted history - to say the least - despite the only competing parties being EADS and Northrop Grumman on one side, and Boeing on the other. 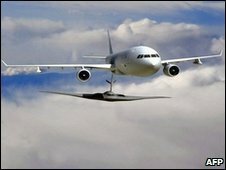 Until they abandoned their latest bid interest in early March, Northrop and EADS planned to supply a tanker plane based on the large capacity A330 plane made by EADS subsidiary Airbus. Boeing's tanker, the KC-767 is based on its smaller 767 plane.